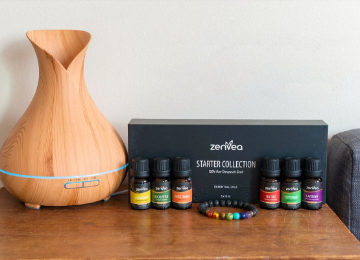 Our Zenvea 550ml Aromatherapy Diffuser is a state-of-the-art humidifier, designed to purify the air you breathe, while giving-off a delicate, pleasing aroma. Simply fill the machine with water, to enjoy some of the cleanest air you’ve ever experienced, or add a few drops of fruit, or plant-based oils to fill the air with an aromatic, pleasant smell. 1. Remove Foul Smelling Air For You And Your Family. 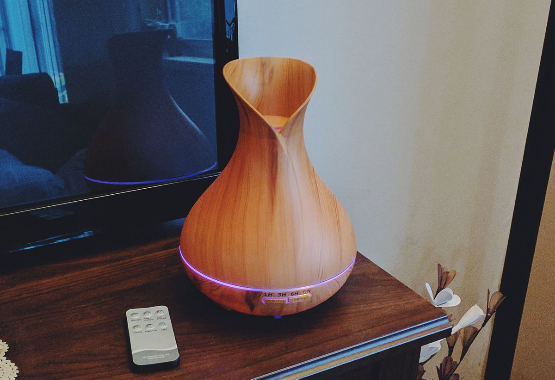 Pesticides, allergens, and foul smells; if you want to rid your air of these toxins or smells, you can use an essential oil diffuser along with your favorite smelling oils. 3. Aides a Good Night’s Sleep. A diffuser can help you relax, creating the perfect sleeping environment. 4. Safer Than Candles and Incense. Leave the diffuser running while asleep, or away from home. With no fire risk, you enjoy added safety. What Should I Look Into Before Buying A Diffuser? The most important thing to look for, is that the diffuser you choose is built to a high-quality. This ensures you’ll be benefiting from the cleanest air possible, and also reduces the chances of components breaking. Our Cool Mist Aromatherapy Diffuser uses only the best parts and materials, ensuring you can enjoy regular use, without worrying about breakage, or malfunction. Other factors to look for are: how long does it run for, does it produce a cool or warm mist and does it include any other functions? Most diffusers on the market will not last a full night's sleep. Water capacity plays a huge role in how long a diffuser will last. Our Cool Mist Aromatherapy Diffuser has a massive 500ml (2 cups) water tank while still keeping it's size similar to other diffusers on the market. This allows our diffuser to run for up to 12 hours uninterrupted. It's not just the water capacity that matters when choosing a diffuser though. You need to know whether or not your diffuser is producing a cool or warm mist. What most people do not actually realize, is that producing heat while diffusing the oils will actually destroy the essential oil properties that should be getting released into the air. So while you may still enjoy the pleasant aroma, you would not actually benefit from the oil's properties. 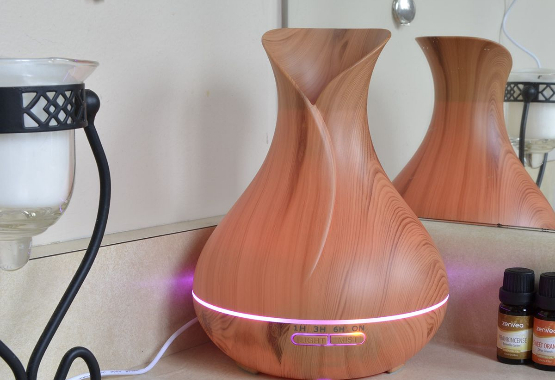 As the name suggests, our Cool Mist Aromatherapy Diffuser does not use a heating element. We use a special, state-of-the-art atomizer technology which allows the device to disperse the mist without ruining the oils benefits. Candles and incense have been around for centuries and it's only now that we have a safe alternative that not only works well but allows you to leave it running unattended (or while sleeping) with no fire risk. Not only does our Cool Mist Aromatherapy Diffuser not use any fire, we've also built in an additional safety mechanism which forces the diffuser to shut-off automatically, if it runs out of water while unattended. When choosing a diffuser, this function is absolutely vital, as running a diffuser without water will actually damage the machine and potentially act as a fire hazard. While fire safety is important, we know a lot of people also use candles as a light source, which is why our Cool Mist Aromatherapy Diffuser also comes with a built-in 10 LED light system. The diffuser can cycle through 10 different LED colors, set to a specific color or simply turned off, if you do not wish to have any light. This LED effect can be run without diffusing oils as well, so you can use it as a night light. Can you imagine using a T.V without a remote control now? 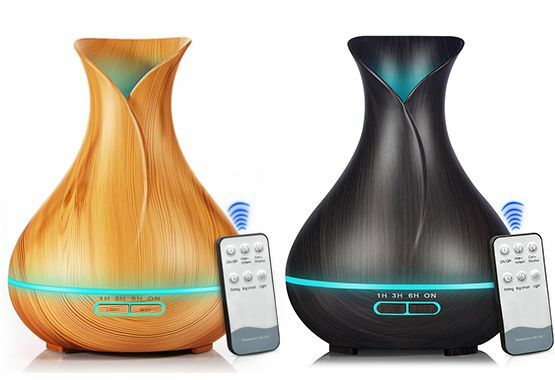 Convenience is important and we realize that; which is why our Cool Mist Aromatherapy Diffuser comes with a remote control. 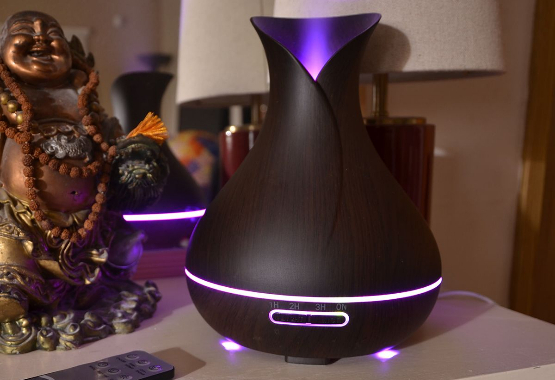 Being able to switch off the LED light, change the color, turn the diffuser on or off while in bed or another room is a huge factor that many aromatherapy enthusiasts are beginning to appreciate. 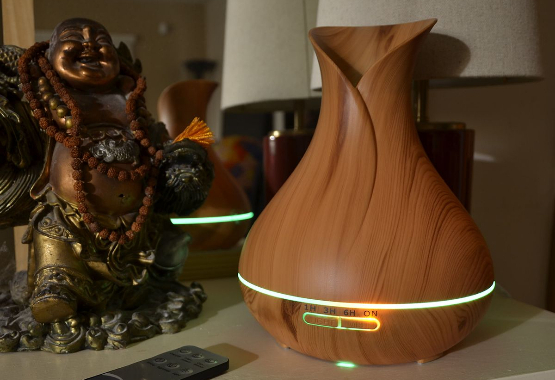 The best part of using our diffuser, is that it is extremely easy to operate. Check out our video below to see how easy it can be! Plug type will be automatically selected based on country. Due to popularity, we may sell out soon. If our cart says "SOLD OUT" please check again in a few days, as we have more stock on the way.